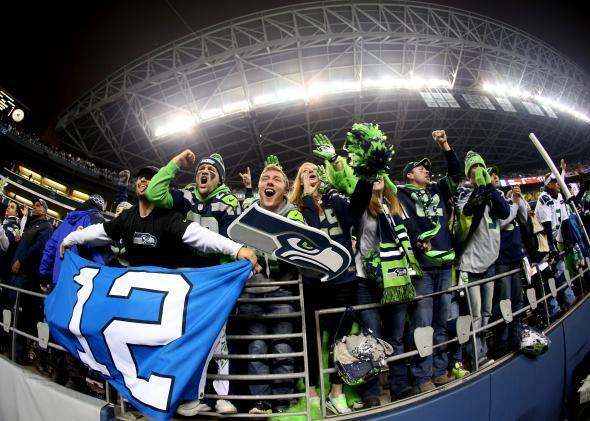 Seahawks, Super Bowl: How the heartbreak of Seattle sports fandom made me who I am today. How the heartbreak of Seattle sports fandom made me who I am today. Seattle Seahawks fans celebrate after the Seahawks’ earned a trip to the Super Bowl by beating the 49ers. Seattle, out-of-towners keep telling me, is experiencing a wave of football furor unlike any other NFL market they’ve ever seen. You can’t miss the signs of Seahawks Fever. It’s not the just the familiar “12th Man” flag on the Space Needle. This week, each construction crane and radio antenna in town is emblazoned in Seahawks colors. Every building in the skyline has installed its own navy and green floodlights, and the effect at night is something like a hand-tinted cityscape from a lost German Expressionist classic. The “emerald city” of the Pacific Northwest has literally become the Emerald City. Last week, Seattle’s venerable alt-weekly, the Stranger, ran a sports page for the first time in its 23-year history. On Saturday, the cast of the Seattle Opera’s production of Rigoletto came onstage for a final curtain call dressed in Seahawks jerseys. Today, I ran out to a nearby superstore in hope of finding a Seahawks jacket for my suddenly football-obsessed bandwagon fan of a son. The store had planted a “12” in its floral arrangement out front; a crowd was taking pictures. Inside, they had been completely sold out of Seahawks-wear for more than a week. This town of mild winters and mild-mannered computer engineers is suddenly more sports-obsessed than any icy Rust Belt football fortress. And why not? A Super Bowl appearance would be cause for celebration anywhere, but in Seattle, sports success is a particularly rare blossom. In recent years, MLS’ Seattle Sounders and the WNBA’s Seattle Storm have had some success, with the Storm even winning a few titles. But the last professional championship for a Seattle team in one of the four major sports was the SuperSonics’ 4–1 win over the Washington Bullets in the 1979 NBA Finals. Before that, you have to go back to the Seattle Metropolitans, a regional hockey club that won the Stanley Cup in 1917. I was a North Seattle kindergartener when the town won its last championship. It’s the first real news event I remember. This year, I turn 40. Seattle can’t claim the longest championship drought currently running in America. In Cleveland, 2014 will mark half a century of abject failure. San Diego, for its part, hasn’t won squat since 1963. But Seattle often winds up atop lists ranking cities’ sports futility, because our long decades of mediocrity have been punctuated with occasional moments of hope—always followed by bitter, soul-crushing disappointment. Also, the Sonics no longer exist. Clevelanders can at least take consolation in the fact that they still have their terrible NBA team. Hooray? Consider the Seattle Mariners. As a child I often went to see the lowly Mariners play in the Kingdome, led by future non-Hall-of-Fame “stars” like Alvin Davis and Harold Reynolds. Usually the M’s lost, and even if they won, you still had to spend a few hours in the dreary concrete Kingdome, the major league ballpark that most closely resembled an airport parking garage. Only the arrival of Ken Griffey Jr. and one well-timed double by Edgar Martinez saved the team from a mid-’90s move to Tampa. Six years later, the team was a legitimate contender, winning a record-tying 116 games and briefly making believers out of fans—until they lost the pennant in five games to the New York Yankees. Even more demoralizing for Seattle fans: The series was held a month after Sept. 11, 2001. For the only time in history, America was actually cheering for the Yankees. The Seahawks finally made it to the Super Bowl in 2006, their 30th season in the league, only to lose to the Steelers on account of some forehead-poundingly iffy officiating. (Years later, the ref apologized for those bad calls. Thanks, we appreciate that.) The Sonics flirted with greatness from time to time after that 1979 championship, but lost in the NBA Finals in 1996 to a 72–10 Bulls team. The team is now situated for fantastic long-term success … in Oklahoma City. The NBA allowed the move in 2008, while refusing to OK a similar deal to move the Sacramento Kings to Seattle five years later. The sports gods are capricious, especially when they are David Stern. I myself am a product of the sturm und drang—and the inevitable heartbreak—of Seattle sports fandom. You learn quickly never to hope for too much or to celebrate too soon: The specter of eventual futility lies on the other side of every small victory. Expectations must be managed. When I went on Jeopardy! in 2004, my only goal was not to be That Guy, the one with negative money who gets booted before Final Jeopardy. Even after the first win, I expected to lose every subsequent game. This is the kind of psyche you get up here, molded not only by the annual six months of drizzle, but also by the sub-.500 memories of Harold Reynolds and Jim Zorn and Rashard Lewis. Only in Seattle could an NFL team take the field to the pathos-filled violins of “Bitter Sweet Symphony,” as the Seahawks do, and have everyone understand. Given Seattle’s famous climate, local weather forecasters have had to coin a word for non-dreary interludes: they are “sunbreaks.” When the rain stops and the clouds lift even for a few hours, locals pounce. Offices empty; parks fill up. It’s the upside of bracing for misery: Any ray of hope, no matter how transient, is a cause for celebration. That’s what I think about when I see school buses full of Marshawn Lynch jerseys and scowling Seahawks logos fashioned out of Post-its on high-rise windows: We are enjoying a sunbreak. And who knows? We’re not supposed to hope, but maybe this is the team that ends the heartache. Maybe, after almost 40 years, the clouds are finally lifting.